Some of my oldest dearest friends- together in a phat house in Kauai- chillin- jammin- lovin!- Congrats Guys! Valerie will be performing in this fundraiser for Tahoe Women's Services to help promote non-violence against women and children. Spending a little quality time on the playa!! see you there! Valerie and Steve are taking the plunge!! "May Mayhem" gear on and get ready to dance all night long! DJ's Evan, Bryn, and GT will be sharing this special night! "May Mayhem" gear on and get ready to dance all night long! DJ sWiTcH will be special guest! "Asia April" gear on and get ready to dance all night long! Join the Tribe and I as we rock "Breeze" North Lake Tahoe's newest entertainment complex! Get your "Spring Dream" gear on and get ready to dance all night long! Mardis Gras in the Gaslamp! Get ready to frolic in the streets of downtown San Diego as Valerie and the Vibe Tribe take over an entire street stage for the night- We will have many extra surprise additions to the usual magical festivities! 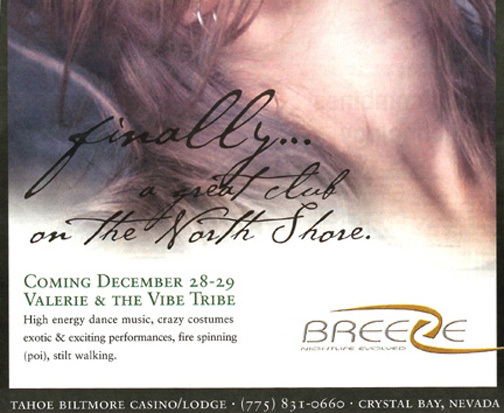 Join the Tribe and I as we rock "Breeze" North Lake Tahoe's newest entertainment complex! Get your "Winter Fantasy" gear on and get ready to dance all night long- Special Guest DJ sWitch! Join the Tribe and I as we rock "Breeze" North Lake Tahoe's newest entertainment complex! Get your "Winter Fantasy" gear on and get ready to dance all night long- Special Guest DJ Mario! Join the Tribe and I as we celebrate the grand opening of "Breeze" North Lake Tahoe's newest entertainment complex! Get your funky gear on and get ready to dance all night long! Join us in helping sponsor the Allen family of Julian get their lives back together after their home was destroyed in the SoCal fires. Valerie Solo DJ perfromance in groovy San Fran with the Divas. Sponsored by Just Say Agency. Valerie solo DJ performance with Spacegirl, DJ Elz, Ariel Cybana at the Luxor Hotel. Sponsored by Just Say Agency. Join me for a night of musical magic with the Divas! Join the Tribe and I for a FREE Friday event from 4:00 to 7:00 pm at beautiful Squaw Valley. Bring the kids to dance and play with the stilters and hula hoopers!